Do you find the lockscreen of your iPhone or iPod touch a little too boring? If yes, then a new tweak called Earth Lockscreen can help you make it interesting and fun again. It adds a fully interactive rotating globe on LS, which also lets you zoom as well as move the globe in any direction. The globe that is added is highly detailed and well lit, letting you to see all parts of it. It offers a much better looking experience to the user than a still wallpaper. To rotate the globe in any direction all you have to do is slide on it. You can even zoom on it by performing the pinch-to-zoom gesture. While you can set any wallpaper in the background of the Earth, you will get the best and most realistic result when a black wallpaper or something resembling our solar system is used. 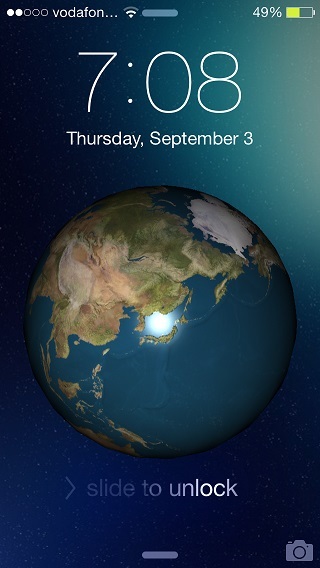 The Earth Lockscreen tweak lets you enable or disable the globe from its preferences page. The affect is implemented immediately, so you won’t have to respring your device every time you turn it on or off. While the tweak works without any performance issues it does acts weirdly when you have lockscreen notifications or slide to passcode screen. We hope these issues will be fixed soon. 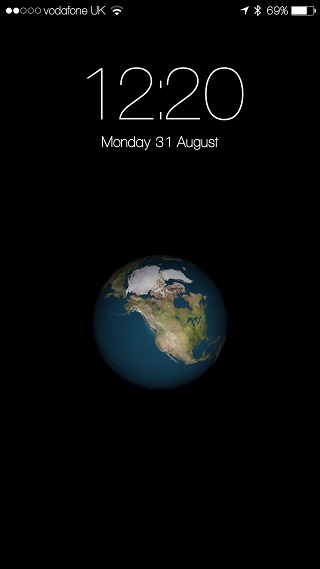 Earth Lockscreen tweak is available in Cydia for free. It does not support iPad, yet.